The plugin doesn’t work with another plugin I have installed. 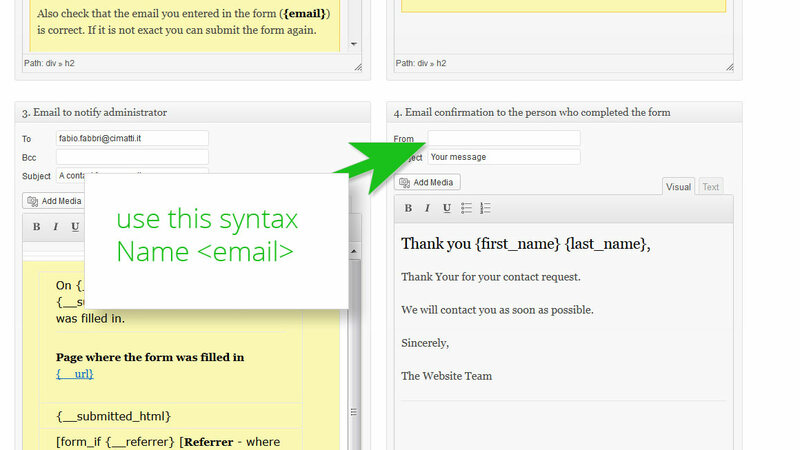 We have done our best to make WordPress Contact Forms compatible with most plugins out there. It is compatible with qTranslate and most multilingual plugins. It has been specifically designed to work well with caching plugins like W3 Total Cache. It works fine with SEO plugins like All in One SEO Pack, WordPress SEO by Yoast. Remember that WordPress Contact Forms requires at least WordPress 3.5.2. Make sure that the plugin version installed is compatible with your WordPress version. 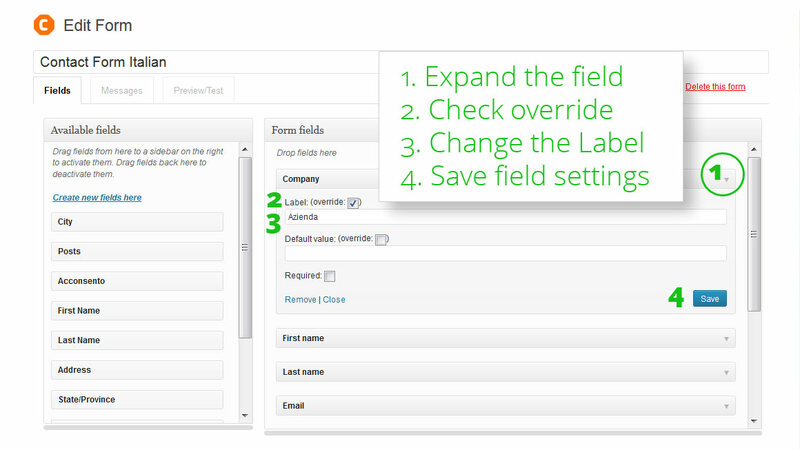 WordPress Contact Forms allows you to create all the fields you need in the Fields page. Once you have created them you can reuse them in all your forms. Drag and drop seems not to work. Make sure you have the latest WordPress version and that update all the other plugins you are using have been updated. I had a similar issue when I updated from WordPress 3.5 to 3.6 and I didn’t update the plugin “Use Google Libraries”. This caused a conflict but upgrading the plugin, drag and drop started to work again. If after the updates you still have this issue, please let us know what plugins you are using and we will try to understand where the problem could be. We want to customize the name that emails come from, so that recipients don’t see all of the confirmation emails as coming from “WordPress”. However, I can’t find the place to do that anywhere. The syntax you can use is the standard Name <email> that can be used in email clients. For example I could set it to Consulting Man <consultingman@yahoo.com>. Once saved in the Settings page the address you choose becomes the default value for all other forms. If you wish you can ovverride this and other settings in each form in the Messages tab. Check if your WordPress installation can send the password recovery mail. Contact Forms plugin uses the same mechanism to send emails, so if this doesn’t work you should check why you can’t send emails from your web site in general. This may depend on various factors, for example your web hosting provider may have disabled email sending, or you have to use some settings, or maybe you have to use a specific “from” email (or at least one under the domain of your site). If, on the other hand, you receive the password recovery email then contact us using the forms on this page. Can I change the languge of the buttons? Instead of SUBMIT button I want an ENVIAR button… is there a possible? WordPress Contact Forms was designed with multiple languages in mind. All fields, including checkboxes, buttons, drop down menus can have a language change. This is particularly useful if you have more than one language on your website. The best practice is to use only one field for each type of information you wish to collect and to change the language settings in the individual form. To do this go to edit the form where you want to change language. 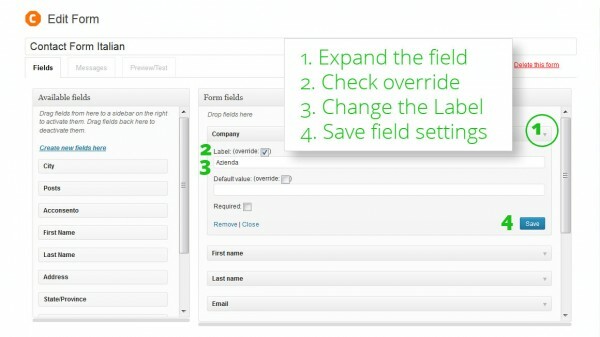 In the “Fields” tab on the right the form fields are displayed in the order you have set them. Check the “ovverride” checkbox. This will allow you to change. Change the Label and, when necessary the default value. This way the “Name” field can become “Nombre”, “Nome”, and “Submit” can become “Enviar”, “Invia” and so on. There are other ways of achieving the same result but this is the recommended way because it will make exporting the data from all forms easy and painless. Is it possible to add a datepicker to the form? This is an interesting feature that we will implement it in the next release. We estimate to release it within the next couple of weeks, along with other new custom field types. Meanwhile, you can create a custom field for date as “Text Field”. When we release the next version, you can edit this field and change the type to “Date with Datepicker”. Fill in the following form. We will do our best to answer all enquiries. Cimatti will not share your personal information with others. All the data you send us will be treated according to Italian privacy laws.